backup is and why it is important. we can take an image of the entire disk using programs like Norton Ghost. 2003 & 2008 using what we already have in the server like NTBACKUP and WBADMIN. 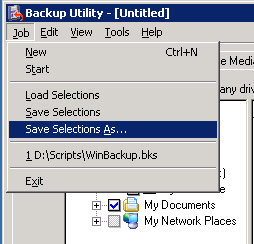 1- Make a selection of what to back and save it as a selection file. three folders in drive X: (Today, Yesterday, Old). a new Today folder will be created. script. For example by creating folders with the names of week days. 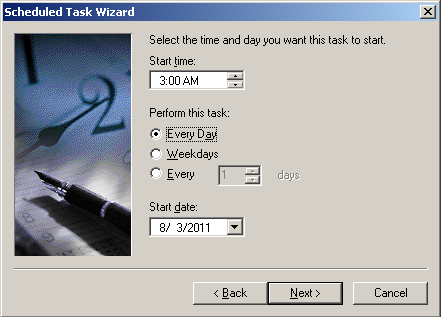 Let’s say you want it to be automatically executed everyday at 3:00 AM. Account, Click Next then Finish. Scheduler, and The Backup Report from The report viewer in NTBACKUP. Pingback: New Software/Repository Backup & Restore Scripts | xjonquilx | Mepis, Ubuntu, Fedora, Linux, Oh My! It works upto creating a folder today after that no backup running creating in that folder. Hello, did you add the ntbackup command to your script? Thanks a ton.Now it working fine.I made some mistakes while adding the script and then i corrected it now its working fne.Once again thanks a lot!!!! !